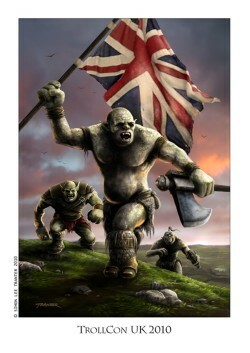 The first attempt at such an event for UK Tunnels & Trolls aficionados had been eagerly awaited for some months. With an expected attendance of 20 or more it looked like being a truly fabulous occasion, but in the end there were high numbers of last minute hitches and subsequently only half a dozen of us were able to grace the rather swank (by gaming standards anyway) Strathallen hotel in Birmingham. Knorrrskk, an enterprising Troll from Gloucestershire, deserves a good deal of credit for organising the venue and program and being prepared to back the venture with his own money. The sudden reduction in potential attendees meant he was likely to take a significant financial 'hit', but the Trolls of Trollhalla rallied round and donated enough funds to offset any potential shortfall. Thanks must go to Seorus Lockerry, Trrrommm, Naharaht, Grrralf, Zanshin, Roost Uhrr, Khayd'haik, Mist-Tikk Foo-all and Fishflower. Really guys, without your support the event may have folded before it had even begun. Bengakk, Darrgh and Cartomancer enjoy a hand of Ogreocre. The fun started on the Friday evening, and where better to meet fellow trolls than in the bar? Along with the beer and introductions, those present enjoyed a few hours playing card and board games. Among the highlights was an increasingly competitive session of the TrollGod's Ogreocre card game, played with 'real' gold pieces for the stakes. We all really enjoyed it, but, being inclined to mental laziness, were continually moaning that it would be good to have a specific deck of cards wherein the 'magic' ones are marked with their supernatural powers. That said, by the end of the evening we were only occasionally saying things like,"..now what does a black King do?" and had very much got in to the swing of how the game worked and what tactics to employ. In terms of board games, we stuck to some new products made by Tied to a Kite Games - two of our delegates, Knorrrskk and Benngakk, are part of the team who design and make these products - Numerix and H'nurrgh (Check these and other products at http://tiedtoakite.com). The former has a beautifully made wooden board and lovely tactile game pieces while the latter is a racing style of game where Trolls hurry to pick up rocks so that they can clobber and capture their unarmed compatriots on their way back to base. The author of this report has reason to feel proud of himself as he was victorious in the game of H'nurrgh that concluded the evening. Preparations for the delving begin in earnest. And so to the event proper on Saturday. With delegates coming from various places scattered around the West Midlands, it wasn't until 09:30 that there was a quorum present and we could begin to get down and dirty in Trollworld. Knorrrskk had created a new complex of tunnels near the town of Kanuk and our low-level characters set off to plunder what treasures we could from its dank and dingy innards. From the moment that Cartomancer's character greeted the ogre guarding the entrance hall with a slingshot to the testicles, I can honestly say that the fun never stopped. As the morning progressed, Ramsen Triton joined us. He rolled up his first ever T&T character and joined in the fun and frolics like a veteran. Considering the amount of fantastic artwork he has produced over the years for our favourite role-playing game, it seems strange that he had never played up to this point. Finally, Benngakk reappeared to swell our numbers even further and his character created a battle standard from the animated tapestry of a sailor. We didn't find trying to be stealthy while carrying a piece of cloth that was swearing all over the place terribly straight forward. Afternoon tea. The only way to take refreshment at a UK gaming convention. As the day wore on and the pangs of hunger grew irresistible, we decided to order afternoon tea; sandwiches (crusts removed of course! 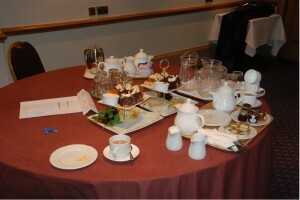 ), scones with jam and cream and a rather rich cake, all washed down with gallons of tea. 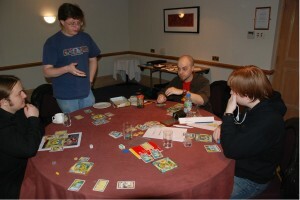 This was a very British break in the proceedings of a gaming convention and enjoyed by all. 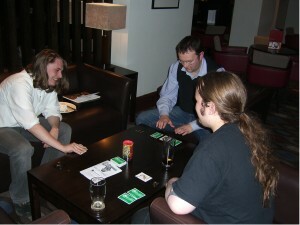 Knorrrskk explains the rules of the Bridge Troll game to his fellow competitors. Having reached a natural hiatus in our dungeon scouring exploits, we decided to play Alf Seegert's Bridge Troll Game. After a relatively short period of adjustment from role-playing to board game mode, we got stuck in and thoroughly enjoyed ourselves. Knorrrskk finally emerged victorious. Perhaps being a board game designer himself just gave him the edge needed to stay just ahead of the rest of us. Ramsen receives his prize for winning the Ugh poetry contest. With the evening drawing on, it was time to see how the voting had gone on Trollhalla for the Ugh poems we had posted earlier in the day on the 'walla. Our fellow trolls had spoken, but we were left with a tie for first place between Bengakk and Ramsen. There was nothing for it but to have an Ugh Poetry Slam between the two of them, with a secret ballot amongst the rest of us to decide the outright winner. 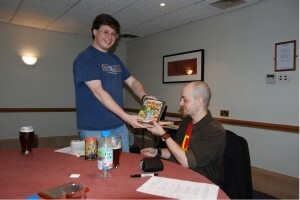 Ramsen Triton took the honours by 3 votes to 1 and was presented with a copy of the Bridge Troll Game that had been donated by Alf Seegert himself. 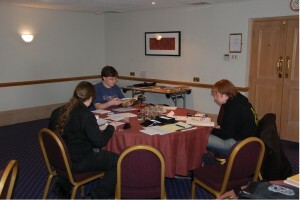 Thanks, Alf, for your generous support of TrollCon UK 2010, it really was much appreciated. 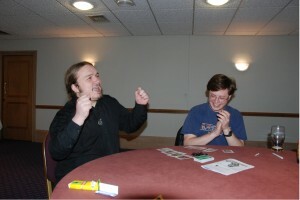 Cartomancer celebrates victory in the last game of Ogreocre. We just had enough time left to pop to the bar and get a beer with which to toast the Trollgod himself and finish the event with a final game of Ogreocre. It really was nip and tuck, with Cartomancer and Knorrrskk eventually fighting it out for ultimate success. For most of the final hand it looked as though our conference organiser was going to walk away with the prize - a copy of my new mini-solo 'Devotion to Duty', now available via Lulu - but with the turn of his final card, Cartomancer turned defeat to victory. It was a very fitting end to a truly fabulous day of gaming. 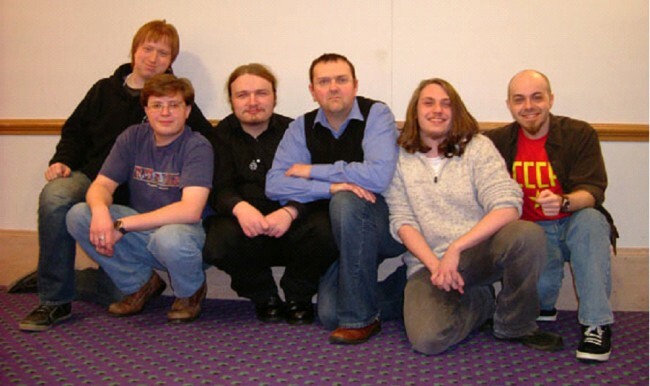 All those in attendance immediately committed themselves to attending TrollCon UK 2011. Let's hope there will be more delegates at next year's event. What is certain is that it will be very hard to improve on the fun we all had this time around. "Tunnels & Trolls" and "T&T" are trademarks of Flying Buffalo Inc. and used with permission. "Tunnels & Trolls" was originally created by Ken St. Andre.